Step inside the 2019 Chevrolet Cruze, and see firsthand why it’s a top-rated vehicle in the Glendale Heights area. The Cruze, which has a refreshed look, comes fully equipped with the latest in technology, innovative safety features, and an interior so comfortable, you won’t mind long commutes to work. Stop by Sunrise Chevrolet to learn more about this affordable vehicle. The 2019 Cruze may be a compact car, but step inside, and you will instantly see how roomy it is. This five-passenger car provides front head and legroom of 38.9 and 42.0 inches respectively, and rear head and legroom of 37.30 and 36.10 inches respectively. The 60/40 split seating helps you configure the storage space you need in the interior. You can fold down half of the seats for extra luggage, sporting equipment, and groceries or enjoy 42.7 cubic feet of space with both seats folded. The cargo area tray and cargo net let you organize your items while keeping them secure. Also available are upgraded features like a leatherette trim and heated seats that add an extra feeling of luxury as you’re driving through the streets of Carol Stream. Experience the 2019 Chevy Cruze Interior at Sunrise Chevrolet! Are you ready to explore everything the 2019 Chevy Cruze has to offer? 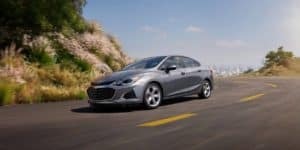 Visit Sunrise Chevrolet, and we’ll check out the 2019 Chevy Cruze interior, trim prices, available features, and take a test drive in Glendale Heights. Contact us today with any questions. We can’t wait to get you behind the wheel of a new Chevy Cruze!